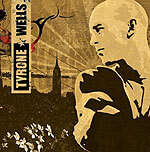 Combining alternative rock's disjointed construction, the rich harmonies of soul and R&B, and the lush melodicism of the best power pop, Tyrone Wells' new CD is a beguiling bit of ear candy. The subject of his songs is a pretty traditional swath of love songs, and no one will confuse his lyrics for those of Dylan. But given the purity of his voice and the gorgeous melodies, the boring lyrics aren't too much of an impediment to enjoying the music here. Wells never descends into bombast, either, which he could with the power of his pipes. Instead, he always finds the right groove and consistently chooses taste rather than volume. With a rich voice, Wells has the chops to caress the dozen tunes on the new album, most of which he wrote or co-wrote. His voice is so rich, it reminds more than a little of some of the classic R&B singers. His songs are so melodically decadent, they remind you of the Finn brothers. At its best moments, the result sounds a bit as if Teddy Pendergrass or Luther Vandross met up with Crowded House. With more moments like that, Tyrone Wells could find himself among the very best who've ever taken up singing popular songs.